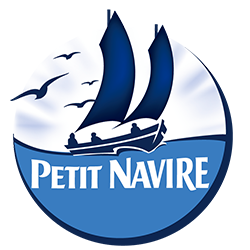 Founded in 1932, the Petit Navire brand is built on core values such as simplicity, and natural purity. Thanks to its high quality standards and know-how, Petit Navire has become the leading brand of canned fish. Today, the company is committed to continuous innovation offering consumers a large variety of tasty products prepared with natural ingredients. Petit Navire products are made in the factories located in Portugal, Ghana and Seychelles, to be even closer to fishing areas and thereby providing first quality products.